Last weekend, I received a recipe request from my uncle. We were seated around a table at the Venus Restaurant, a little diner where my grandmother has breakfast each and every morning. Each day, my grandmother is joined by at least one, and sometimes many, of my aunts, uncles, and cousins. Whenever my family travels to Long Island, we’ve made it a routine to join the group at breakfast before we hit the road for home. I get the corned beef hash and eggs every time; eggs cooked over-hard, rye toast, and fries. Well, this past weekend, as I was eating my corned beef hash and eggs, my family was discussing some of their favorite recipes from this very blog. It thrills me to know that the people I love are enjoying my little work of culinary joy. We talked of gravies, soups, and macaroni and cheese. And then my Uncle Gene asked if I take requests. I absolutely take requests!! In fact, I love requests. 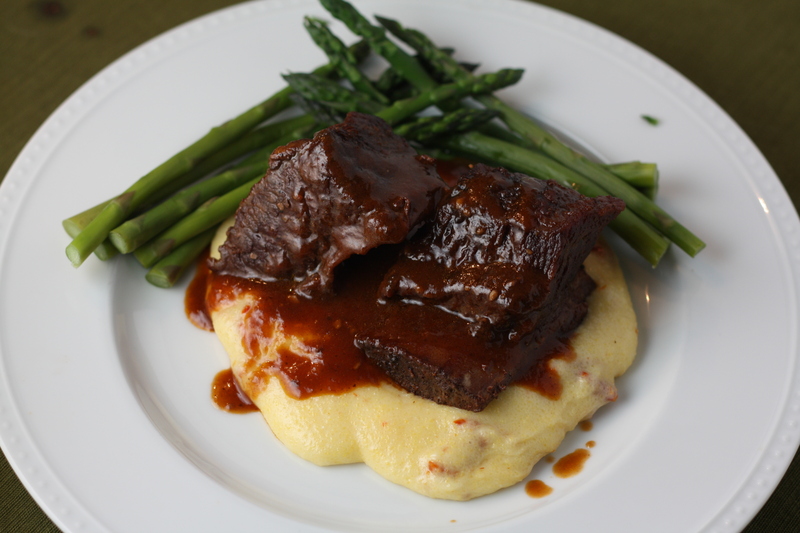 His request was clear and precise; braised short ribs with polenta. My mouth watered at the thought. It didn’t take me more than a minute to formulate a plan. Braising is a wonderfully simple technique which produces extraordinary results. During braising, meat is typically seared over high heat and then cooked slowly in a bit of liquid at a lower temperature. The slow cooking process breaks down the connective tissues of tougher cuts of meat, resulting in a very tender and flavorful result. As the meat cooks, the braising liquid reduces and thickens into a ready made sauce for your completed dish. Combine whatever liquids and seasonings strike your fancy. For the braising liquid in this dish, I chose to use a simple combination of beef stock and red wine, combined with accents of tomato paste, garlic, and onion. Perfection in simplicity. My uncle requested polenta to accompany the braised short ribs. Polenta is, quite simply, boiled cornmeal. A basic polenta is made from yellow cornmeal, simmered in boiling water or stock until it’s smooth and thickened. To add a bit of rich creaminess to our polenta, I incorporated butter and cream at the end. The addition of parmesan cheese and sun-dried tomatoes makes this polenta the perfect partner to our tomato accented short rib sauce. Preheat oven to 350 degrees. Heat olive oil in a large oven-safe pan over medium/medium-high heat. Season the short ribs with salt and pepper. Add the short ribs to the pan and cook for a minute or two on each side until nicely browned. 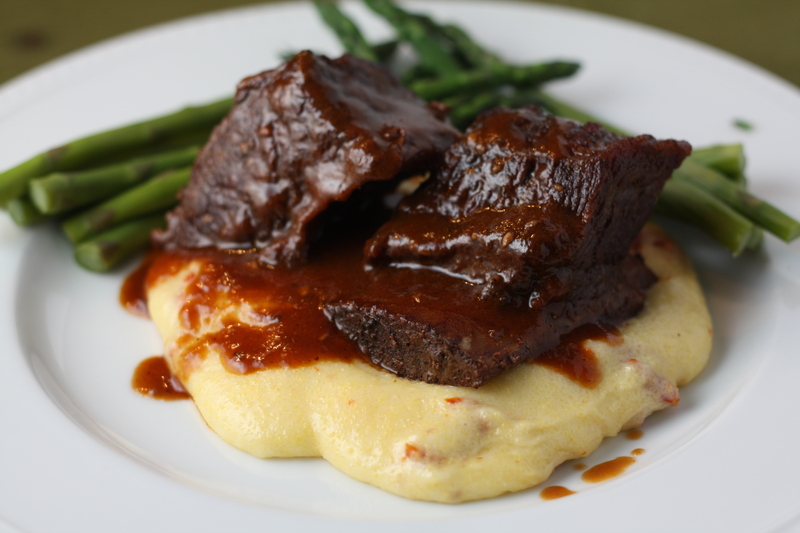 Remove the short ribs from the pan and set aside. Reduce the heat to medium. Add the onion and garlic. Cook for 3-4 minutes until the onion is soft and golden. Add the red wine, beef stock and tomato paste. Whisk to combine. Bring to a simmer and allow the mixture cook for about 3-5 minutes. Place the short ribs in the liquid. (They will not be fully submerged.) Cover the pan and place it in the oven. Cook for about 2 hours. After two hours, remove the pan from the oven. The meat will have pulled away from the bones. 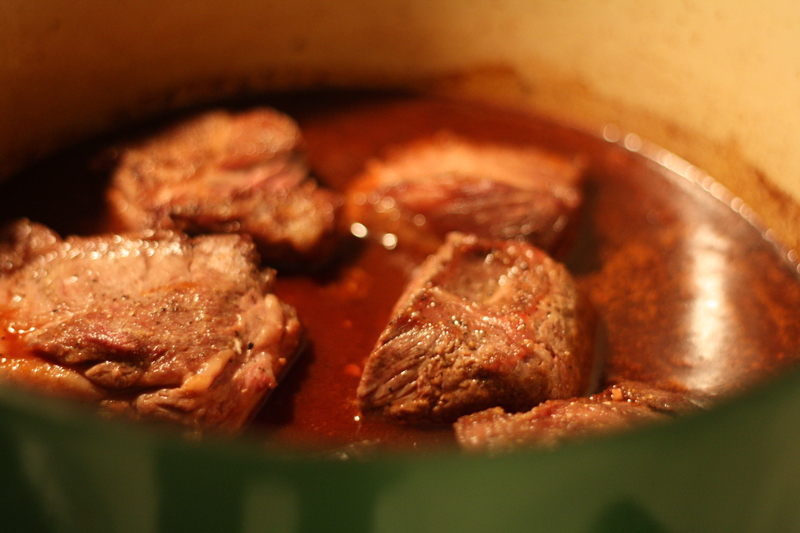 Remove the short ribs from the liquid and set aside. Discard any bones which have fallen away from the meat. Strain the sauce. Allow the sauce to sit for a couple minutes so that the excess fat will rise to the surface. Skim the excess fat off of the sauce. Taste and season with salt and pepper. If you desire a thicker sauce, pour the sauce into an uncovered saucepan and simmer until the sauce has reduced to your desired consistency. Bring 1 1/2 cups water to a boil. Meanwhile, in a small bowl, combine the remaining water, corn meal, and salt. Once the water is simmering, slowly stir in the cornmeal mixture until smooth. Continue stirring and cooking over low heat for a couple minutes until the mixture thickens. Cover and allow to cook over low heat for 5 more minutes. Stir in the butter, cheese, sun-dried tomatoes, and cream. Taste and adjust seasoning with salt and pepper. Posted in Beef, Cheese, Food, Main Course, Recipes, Sauces, Side Dishes and tagged autumn, beef, braising, Cooking, culinary technique, Eating, fall, family, food photography, italian food, Recipes. Bookmark the permalink. Thanks!! I see you’ve started a blog too! 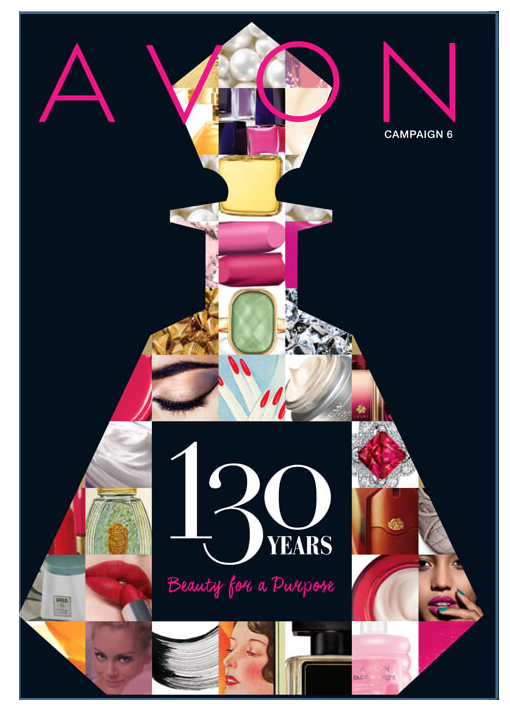 I look forward to reading it! Will you be at this years Christmas party? I’m baking quite a few things for it so I’ll be posting about it on my blog when it gets closer to the party. Unfortunately, I won’t. We host Christmas up here and our house guests arrive that day. I’m also cooking for someone else’s party that evening. Sad to miss the family party though! I’ll keep a lookout for your baking posts! As you said – “Perfection in Simplicity”. These ribs look and sound delicious. Such a simple recipe for such a yummy result! What am I missing…I am not seeing the sun dried tomatoes in the recipe? 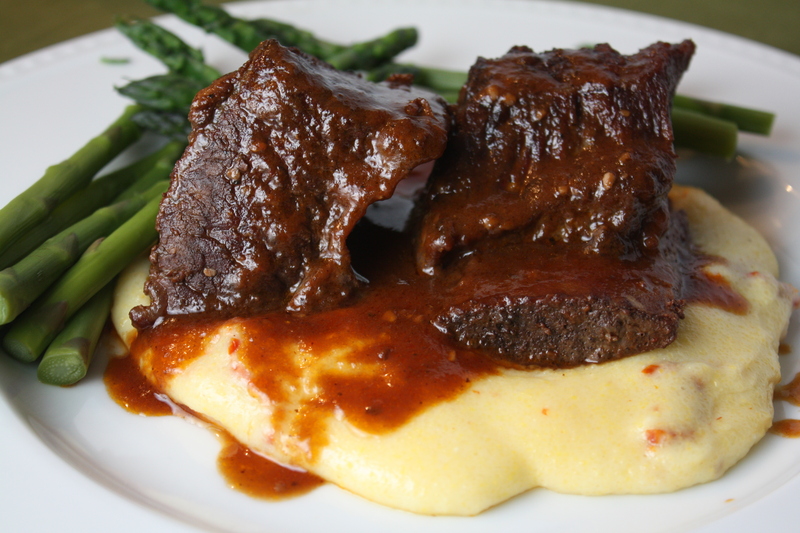 Is the tomato aspect come from the short ribs side of the receipe when you place it on top? Oh goodness…you’re not missing anything! Somehow I totally forgot to include the sun-dried tomatoes when I wrote the recipe. I’ll get that fixed up right away. Thanks! 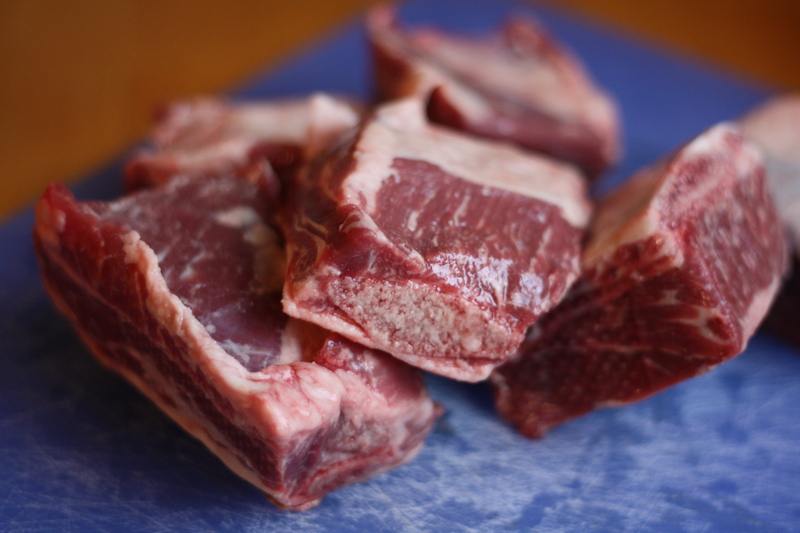 I could only find boneless short ribs, how should I adjust the cooking time?